I'm the delicate-fingered one chosen for seed. 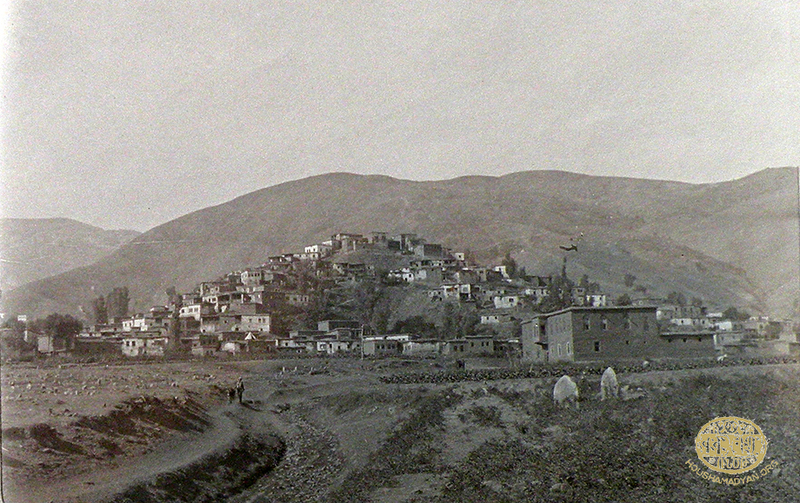 A panoramic view of the town of Moush (Source: Nachl. Oskar Mann, XVI/1, 1-158, XVI/2, 1-11, Staatsbibliothek zu Berlin - Preußischer Kulturbesitz). My mom ate sour tahn [churn liquid or diluted yogurt], she delivered me squealing. My mom got and ate willow, she delivered and raised me bent. My mom got and ate pomegranate, she delivered me to the church door. My mom ate licorice, she delivered me under a wall. My mom ate rhubarb, she birthed me pure gold. My mom picked and ate horse fennel, she delivered and birthed me lame. My mom ate fried eggs, she struck and drove off a gray magpie. Moush Valley - Armenian women (Source: Bodil Biørn collection). The broad, fertile Plain of Moush is surrounded by high mountains—Nemrut, Krkour, Sipan, Kargé, Dzovasar, Dziringadar, and others. Through it pass the Aradzani (Murat), Euphrates, and Meghraked (Karasu) rivers and their tributaries. It's home to numerous small lakes. It also has rich and diverse plant life. The mountains are covered with dense forests of evergreen and fruit-bearing trees: Villagers harvest azorole (haw), plum, blackthorn (sloe), wild pear [likely pyrus pyraster or pyrus caucasica], apple, walnut, hazelnut, rosehip, etc. Many varieties of wild vegetables and greens grow in the fields and on the mountainsides, such as wild artichoke, wild carrots, and wild radish; among the numerous uncultivated vegetables used in food preparation and as remedies for treating various ailments are sorrel (spinach dock), rhubarb, horse fennel (seseli hippomarathrum), peppergrass (cress, pepperwort), capsella (shepherd's purse), turnip-rooted chervil (parsnip chervil), meadow salsify (meadow goat's-beard), wild garlic (crow garlic), and sbidgoug [a plant with onion-like roots and leafy greens; possibly white eremerus or arum]. Among the cereal grains and seeds traditionally grown are wheat, barley, rye, glgl [a millet-like, but larger, seed; possibly proso millet], millet, chickpea, lentil, bean, broad bean, linseed (flax), hempseed, rice, pea, etc. Wheat is planted in late fall or spring. The harvested wheat is stored in grain pits, the sides of which are plastered with hay. The poor grind the wheat by hand millstone, whereas well-off families take the wheat to the water mill. The ground wheat flour, called pnaghoun, is kept in flour storage containers. The bread baked with the new flour is secretly distributed to neighbors by throwing them down through roof openings [used for light or air]; in the mornings, the neighbors consume the bread, saying a blessing: "May God make it acceptable." Among the cultivated vegetables are cabbage, turnip, carrot, beet, potato, radish, eggplant (aubergine), pumpkin/squash, tomato, cucumber, Armenian cucumber [Cucumis melo var. Flexuosus], hot ground red pepper, okra, onion, garlic, etc. Among the fruits grown in Moush are watermelon, melon, fig, walnut, almond, mulberry, quince, peach, apple, pear, grape, plum, apricot, cherry, sour (morello) cherry, oleaster, etc. From Erzerum and Diarbekir they import orange, lemon, date, loquat, olive, mandarin orange, etc. 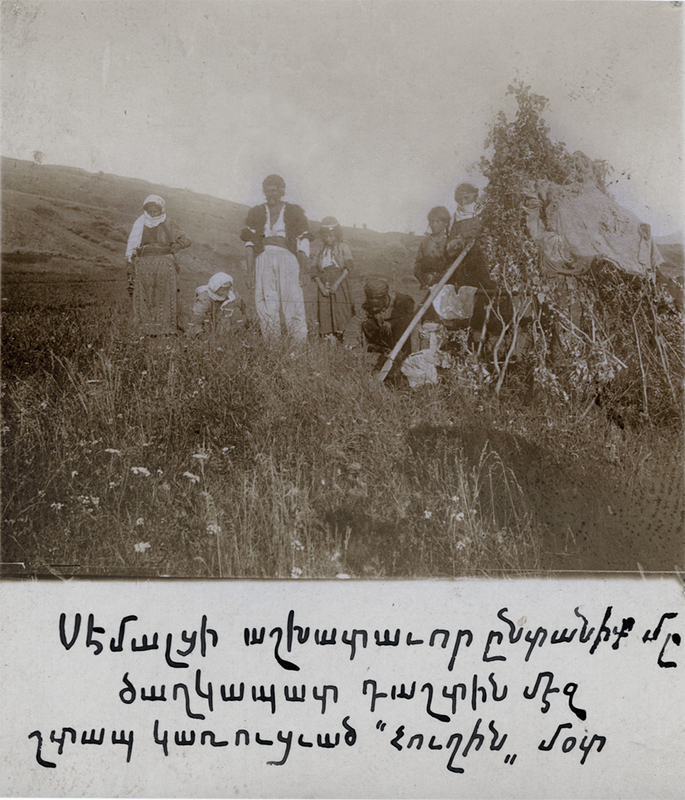 An Armenian family in Moush (Source: Hamazasb Vosgian, Daron-Darouperani Vankere (Monasteries of Daron-Darouperan), Vienna, Mkhitarian Publishing House, 1953). On the slopes of mountains around the city of Moush are vineyards, which are also used as places of recreation and leisure. Some 19 varieties of grape are cultivated. Grapes are used to produce numerous foodstuffs. They are dried to produce raisins. In the courtyard of every house is a basin for extracting the juice of grapes. Grapes are placed in the basin and trod on with bare feet to press out the juice, which flow out from the basin through an opening and into tubs or casks. Water is added to the marc (pomace) remaining in the basin to make vinegar. The extracted juice of grapes is used to make various drinks and foodstuffs. The juice is placed in casks to ferment into wine. Pomace is infused with anise and distilled to make liquor. "White soil" [likely slaked lime (calcium hydroxide), possibly gypsum powder (calcium sulfate)] is mixed into the grape juice, boiled, left to rest, filtered, boiled again for an extended period until it thickens to become roub (a molasses-like grape-based syrup). To prepare rojig (walnut kernels encased in fruit leather), they mix flour into the grape juice, boil it until it thickens, dip into it walnut kernels that have been strung together, and hung to dry. To prepare basdegh (fruit leather, fruit paste/pastille), they spread the thinned grape syrup (or the syrup made of other fruit) onto a flour-saturated canvas and allow the syrup to dry; then, by soaking the back of the canvas with water, they peel off the dried fruit paste. To prepare rechel (fruit jam or candy), they dilute the grape molasses with water and boil the fruit in it; then, placed under the sun, the mixture thickens. Animal husbandry is equally well developed. They breed cows, oxen, buffalo, sheep, goats, horses, and donkeys; among fowl, they raise chickens, ducks, geese, doves, and turkeys. Traditionally, they butcher large animals only once a year, to provide meat for khavourma [also, ghavourma, braised meat browned and stored in its own fat]; during holidays or for guests, they prepare meals with fowl flesh. They use the milk of horned animals for yogurt, cheese, curds (similar to quark and cottage cheese), butter, ghee (clarified butter), etc. They use two types of churn (tstsum): gakhman ("hanging") and nsdman ("sitting," cask-like). Fishing takes place in nearby rivers and lakes. For consumption, fish is stewed with vegetables (khashlama ["boiled"]) or grilled. 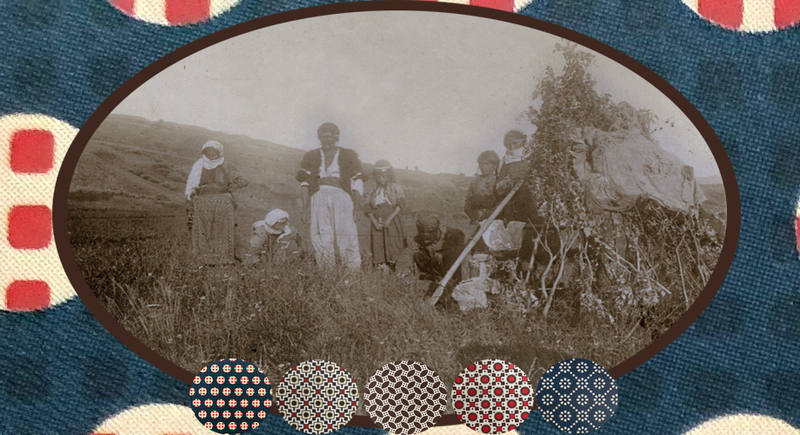 Moush, an image from daily life in the village (Source: Bodil Biørn collection). A low-set round table [or tray or board] is used for family meals; when they have guests, they use a leather soufra (tablecloth). During meals, they sit cross-legged. In accordance with the traditional lifestyle, adults (men) eat first, then younger men, and then the women; children eat separately. Usually, they eat three times daily: a light breakfast (agrat) at 9 AM, lunch at noon, and dinner at 6 PM. However, the laboring classes eat at two other times as well: early breakfast lousmti ["of dusk"] and hramka (at 3 PM). In homes, they eat from communal platters and bowls. Placing bread on one's knee or face down is considered a sin, as is leaving a cup half drunk; when sated, they lean the spoon against the plate, and turn the cup upside down. Salt is imported from Khnous (Hınıs); it's dried, ground by millstone, and stored in casks. Spilling salt, deemed a sacred substance, is considered a sin. Accordingly, during the blessing of homes, village priests bless salt along with water and bread. Pottery is a well-developed craft in Moush. A host of implements are fashioned from clay, including a many types of crockery and pots and pans. 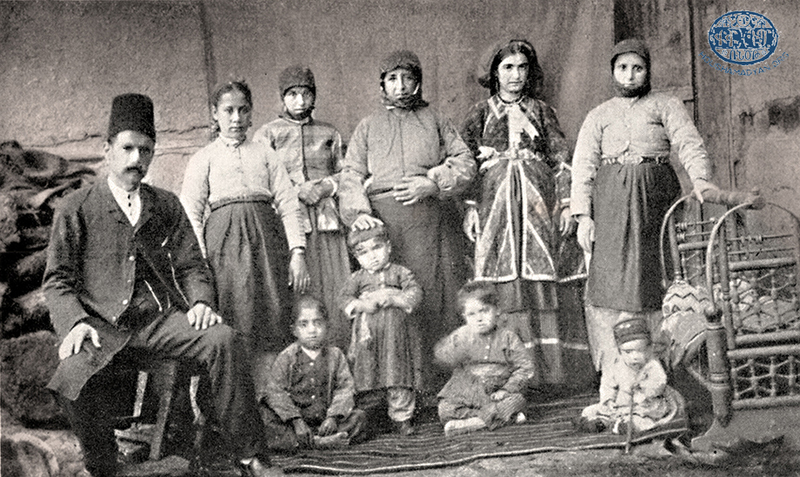 2) Prominent Armenian villagers from Shenig and Gelyeguzan. (Source: Raymond H. Kévorkian, Paul B. Paboudjian, Les Arméniens dans l’Empire Ottoman à la veille du génocide, Paris). Tantapich: a round receptacle, with a handle, into which churn-tahn (liquid) is transferred. 1) 1929: Ardashes Der Khachadourian's parents and paternal grandmother. Standing, left to right: Azniv Der Khachadourian (mother), Hamazasb Der Khachadourian (father). The seated woman is Yeghisapet Der Khachadourian (grandmother); seated in her lap is Khachadour Der Khachadourian. 2) The Der Khachadourian family of Moush, in Beirut, in 1930. Standing, left to right: Arshag, Sayde, Azniv, Hamazasb. Seated, left to right: Badiha; in Badiha's lap, Joseph; Yeghisapet; in Yeghisapet's lap, Khachadour. The women of Moush, as they knead bread dough and bake it, continually pray: "Bread, angel(s) of bread, the just gain of oxen's labor, rise up to intercede with God..."
The toundir (tandoor) is built in the center of the home because it is also the means of heating the home; it's round, dug into the earth. A cross-shaped metal grate is placed on top, and on it they arrange the meal pots and pans. Usually, they light the fire in the morning to cook meals; then, after the fire dies down, they bake bread. Bread is baked nearly every day, especially in large families; it's then stored in hutches or boxes. In the summers, when the animals are taken to the mountains, the bread is baked on a sel (a piece of convex metal under which the fire is lit—a saj). The villages don't have bakeries; only in the city of Moush can one find them, in the market, located in the same part of town as the St. Mariné church. The market consists of numerous stalls manned by artisans and traders. The people of Moush bake distinct types of bread. The most common is called round bread or tandoor bread: a round bread of 2-3 cm thickness and 35-40 cm diameter with a ruddy hue. Similarly prized is the lavash or losh bread, which is thinner, larger [and oval]. Taptapan is a bread the length of lavash, but thicker (1 cm), and with markings made by finger. Tonig bread is cylindrical, slightly flat, and long. Pokon is a round bread with a hole in the middle; also called dzagoulig ("little hole"). Bread made with unleavened dough is called khougli or pagharch. When dough falls of the side of the tandoor and into the ashes, it's called toundran goud; they consider it the angels' portion. Breads are usually made with wheat flour, but the use of millet flour and (rarely) barley is extant. In addition to the usual breads, they make other bread types (often daily) with the day's last ball of regular bread dough. Chop up walnuts and fruit, mix in hempseed; roll out the bread dough, spread the mixture on top, seal the dough, and bake by placing in the hot ashes of the tandoor. Spread the flour-and-ghee filling onto a sheet of dough, fold the dough onto itself, seal it, then bake it; after removing from the tandoor, coat with honeywater [watered-down honey]. On top of rolled out bread dough spread zhazhig (horadz ["buried"]) cheese [herbed cheese (made with whole-milk curds) placed in a clay pot and buried in an ash pit], seal with a layer of dough, and bake in an oven or tandoor. When the surface is browned, remove from the oven, coat it with ghee, cut into slices, and serve. For the dough: mix the yogurt and baking soda, separately mix the ghee and the flour, then combine all together and knead to form dough. Make two balls and leave to rise for one hour. Roll out the balls of dough. Place one sheet on an oven pan, top with the walnut-and-raisin filling, place one black and one white button* (or dried bean) on top, cover with the other piece of rolled out dough, seal the edges, brush with egg, cover and bake. *The white button is a symbol of good fortune; the black, a symbol of misfortune. Chop the onion; sauté half of it in ghee. Mix the unused portion of the onion, the meat, the bulgur, and the greens together; season. Roll up the mixture in blanched cabbage leaves. Arrange the rolls in a pot, filling the gaps between the dolmas with the sautéed onions. Cover with water and cook until the water is absorbed. Chop the onion and sauté it in the ghavourma fat. Chop the ghavourma meat, combine it with the bulgur, the greens, and sautéed onions; season and mix. Roll up the mixture in blanched cabbage leaves. Arrange the rolls in a pot. Cover with water and cook until the water is absorbed. Chop the onions, herbs, and dried tomatoes, mix in the remaining ingredients, and roll the mixture in the grape leaves, forming triangular or square-shaped dolmas. Arrange them in a pot, placing dried plums into the gaps between the dolmas; add water, place a heavy plat on top of the dolmas, and cook. Onion dolma is made with the same filling. Squeeze out the layers of whole, blanched onions by pressing in the sides of the onion. Fill with the stuffing/filling, arrange in a pot, and cook. Toast and grind the hempseeds. Chop the onions and dried tomatoes. Combine all the filling ingredients; roll the dolmas using the grape leaves. When arranging dolmas in the pot, fill the gaps with dried fruit. Add water, place a have plate on top of the dolmas, and cook. Chop the onions, garlic, herbs, and dried tomatoes; combine with the remaining filling ingredients; roll into dolmas using grape leaves. Cut the carrots into circular shapes and arrange them at the bottom of the pot; arrange the dolmas on top, add water, cover with a heavy plate, and cook. Separately boil the various presoaked legumes and grains. Chop the onions and sauté in oil. Crumble the dried tomatoes. Combine all the filling ingredients and roll up the filling in cabbage leaves to form dolmas. Arrange in a pot, filling the gaps with the dried plums and dried apricots. Add water until the dolmas are covered; place a heavy plate on top so the dolmas don't move about during boiling, place a lid on the pot, and cook until the water is completely absorbed. Serve warm or cold. Sauté the onions, add the bulgur, then the water; season; cook over low heat until the water is completely absorbed. Slice the onions, and boil them with the bulgur; before turning off the heat, mix in the ghee and pieces of ghavourma. Boil the erishda (rshda, rshde—homemade noodle similar to vermicelli or spaghetti), drain the liquid, add ghee or sautéed onions. Boil the water, add the rice, cover the pot with a lid, and cook on low heat; when the water is completely absorbed, turn off the heat, top with ghee, again place lid on pot, and allow the pilaf to rest. Boil the lentils, drain. Chop the onions and blanch them in ghee. Boil the coarse bulgur, immediately add the lentils and the blanched onions, place lid on pot, let stand for 10 minutes, then serve. Fry the meat in its own fat together with the onions. Add water and pumpkin that's been cut into pieces; a bit later, add the bulgur, garlic, and seasonings. Cook until the liquid is absorbed. Brown the noodles in ghee; add the bulgur, chickpeas, water, and seasonings; cook over low heat until the water is completely absorbed. Fry chopped mushrooms together with sautéed onions, add coarse bulgur and water, season, cook until the water is completely absorbed. Boil chopped artichoke, add coarse bulgur or rice, cook until water is completely absorbed; before turning off the heat, mix in ghee or sautéed onions. Fry boiled and drained sorrel together with sautéed onions, add coarse bulgur and water, season, cook until the water is completely absorbed. Boil the chopped horse fennel, add coarse bulgur, season, cook until the water is completely absorbed; before turning off the heat, mix in ghee or sautéed onions. Boil broad beans, drain; mix in sautéed onions, beans, coarse bulgur, and water; season and cook until the water is completely absorbed. Boil noodles in the liquid from the churn; serve with ghee on top. Boil water, then add a few beaten eggs while stirring; season with salt, pepper, and herbs; add pieces of stale bread; serve. Chop the onions and fry them in ghee; combine with chopped tomatoes, water, and seasonings; beat the eggs and pour them on top; mix in the chopped greens, and eat after tearing off and adding pieces of bread to it. Chop the mushrooms and onions, and fry in ghee. Add chopped tomatoes and pepper, water, and seasonings. Beat the eggs and pour on top; mix in the chopped greens, and eat after tearing off and adding pieces of bread to it. Chop the onions and sauté them. Layer the string cheese and pieces of lavash bread atop each other. Add boiling water until the lavash is covered. Serve hot after topping it with sautéed onions. Mix the yogurt and flour together, then boil; press the garlic into it. Pour the cooked yogurt mixture onto pieces of the dry lavash placed at the bottom of each dish, then add a small amount of ghee. Serve. Boil the lentils. Separately, mix the yogurt and flour together and bring to a boil. Combine the lentils, chopped onions, ghee, and the boiling yogurt mixture, and continue to cook. Eat after tearing off and adding stale pieces of bread to it. Boil the ornithogalum, add the bulgur, continue to cook; serve after topping with ghee. Cut up and boil the green beans in a small amount of water. Slice the onions, fry in oil, and combine with the beans; season and continue to cook over low heat. Beat the eggs, pour them over the beans, stir; sprinkle chopped greens on top and serve. Cut up and boil the broad beans in a small amount of water. Slice the onions, blanch in oil; add the broad beans and continue to blanch; mix in chopped tomatoes and seasonings, and continue to cook over low heat. Serve with garlic yogurt. Cook the bulgur in an abundant amount of water until it becomes gruel-like. Combine the yogurt, flour, and salt, and boil the mixture; smash garlic into it. To consume the dish, each person fills a dish with the bulgur gruel, forms an indentation in the middle, and pours the cooked yogurt, followed by a spoonful of ghee, into the indentation. Samer is a type of millet, similar to wheat; it's pounded in a mortar, then sifted in a large sieve. Cook the ground samer in a sufficient amount of water, and serve after topping with sautéed onions. "Samer dish with tahn" is prepared by cooking the samer in tahn [diluted yogurt or the liquid from a churn] and served with sautéed onions. "Samer dish with milk" is prepared with milk and served with ghee. Pour enough boiling water over an abundant amount of dried fruit to cover the fruits, and boil for a few minutes. To serve, top with ghee; eat after adding torn-off pieces of bread to it. It's also customary to sauté dried pears in ghee and eat it with bread. Boil presoaked beans, add dried apricots and onions sautéed in ghee, add salt, and continue to cook until tender. Boil the pumpkin in a small amount of water, then smash it to form a paste. Chop the onions and fry them in ghee. Add the sautéed onions to the pumpkin; season; press the garlic into the mixture, and serve. Chop the pickled cabbage and boil in abundant water. Chop the onions and sauté in ghee. Add pieces of potato, the bulgur, sautéed onions, and seasonings to the cabbage and continue to cook over low heat. There is a variant of krchig: Add previously boiled chickpeas and bulgur to chopped and boiled pickled/fermented cabbage; continue to cook; after it's done, add sautéed onions and chopped greens/herbs. Boil the chopped pickle; mix in the cracked wheat, sautéed onions, and small pieces of ghavourma; continue to cook. Serve by garnishing with chopped greens and onions. Boil the lentils. Chop the onions and sauté them in ghee. When the lentils are ready, add pieces of pumpkin, sautéed onions, chopped greens and seasonings, and continue to cook until all the ingredients are tender. Boil the lentils; add pieces beets during the process. Chop the onions and sauté in ghee. When the lentils and beets are fully cooked, mix in sautéed onions, chopped greens, and seasonings, and continue to cook until all the ingredients are tender. Chop all the vegetables, place them in a pot, add seasonings, pour ghee or oil on top, cover with lid, and sauté over low heat. Chop up the meat and fry it in its own fat; add chopped onion and eggplant, and sauté; then add chopped tomatoes, season, and cook until all the ingredients are tender. This dish can also be prepared without meat; near the very end of the cooking process, break two eggs on top. Slice the onions and sauté in ghee; add pieces of potato and continue to cook for a few minutes; add chopped tomatoes, garlic, seasonings, and continue to cook. After turning off the heat, sprinkle chopped greens on top. Cut up the meat and fry it in its own fat; add all the remaining ingredients and sauté over low heat. The sbidgoug is a wild leafy vegetable [with onion-like roots; possibly white eremerus or arum]. It's collected in late spring, woven together, and dried. Before use, it's washed with hot water, chopped, and boiled. Boil the cracked wheat, add the boiled and drained sbidgoug, continue to cook over low heat, adding water as necessary. Serve by adding a small pool of ghee in the center. A common prtosh dish [i.e., incorporating pieces of bread that are torn off and soaked or used for dipping], eaten usually for breakfast: pieces of warm bread are torn off and dipped, using one's fingers, in a small amount of ghee. Some add cheese crumbles or sugar on top. It's prized more when, instead of using common bread made of wheat, bread made of millet is used. Similar common prtosh dishes are prepared with milk or yogurt. 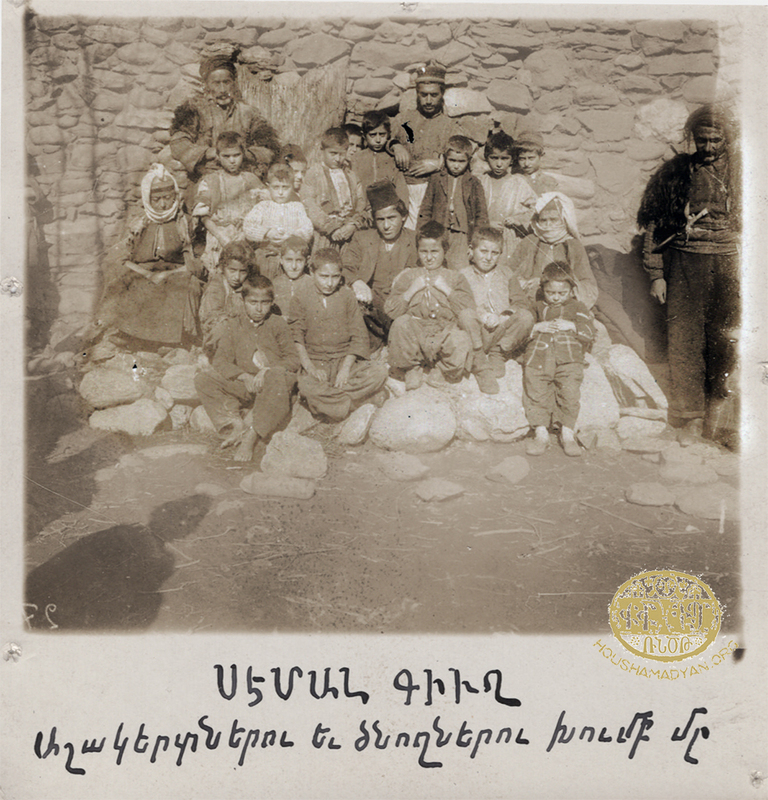 The students and parents of the Armenian school of Semal village, in the Plain of Moush (Source: ARF Archives - Watertown, Massachusetts). While boiling the meat, add sliced onions and the dried peppers and dried tomatoes; season, and continue to boil until cooked. Cut up fish and arrange the parts in a pot, placing pieces of onion, carrot, potatoes, tomatoes, peppers, and greens alongside the pieces of fish; add seasonings and 0.5 cup water; sauté. After cleaning a whole lamb, they rub it with yogurt, season it with salt, pepper, and garlic, and hang it in a tandoor the flames in which have newly died down. Underneath the lamb is placed a sufficiently large cauldron or pot filled with coarse bulgur, onions, and water. The opening of the tandoor is closed with a lid and sealed with mud. Three balls of mud are placed on the lid; when they dry and crack, that's the sign the khorovou has finished cooking. Khabourgha is similar to khorovou, but it's prepared in ovens—and therefore is a part of urban culture. Whole lamb is seasoned with salt, pepper, and garlic, placed on a large pan, and cooked in a large oven. When the fat begins to melt into the pan, they remove the pan from the oven and drain the fat, returning the lamb to the oven, where it begins to brown. The drained fat is customarily used to make bulgur pilaf, which is served together with the lamb. Prepared in two ways: boiled or fried. Served atop bulgur pilaf. Fill a pot with lamb (or rooster) meat, cracked wheat, and water; place the pot in a hot tandoor, and leave it there overnight. After removing it from the tandoor, the harisa is beaten with an oar-like implement. It's served by pouring ghee on top. Some also use chickpeas alongside the wheat. Sometimes, sbidgoug is also added to the cracked wheat. 1. Shish kebab: The meat is skewered and grilled. 2. Fried kebab: The meat is formed into round, flat patties and fried in a pan. 3. Khorovou, in a tandoor: Round, flattened patties are slapped against the walls of the tandoor and baked. Chop and boil the meat, add presoaked cracked wheat. Cook until the water is nearly fully absorbed. The head and trotters of the animal are stripped of hide and scorched by fire, then soaked in brine, together with the animal's stomach, for a full day; the animal parts are then washed and placed in a large cauldron made especially for khash; water is added to the cauldron and cooked in low heat overnight in a tandoor. By morning, the dish is ready for the holiday table; it's eaten after garlic and pieces of lavash bread are added to it. 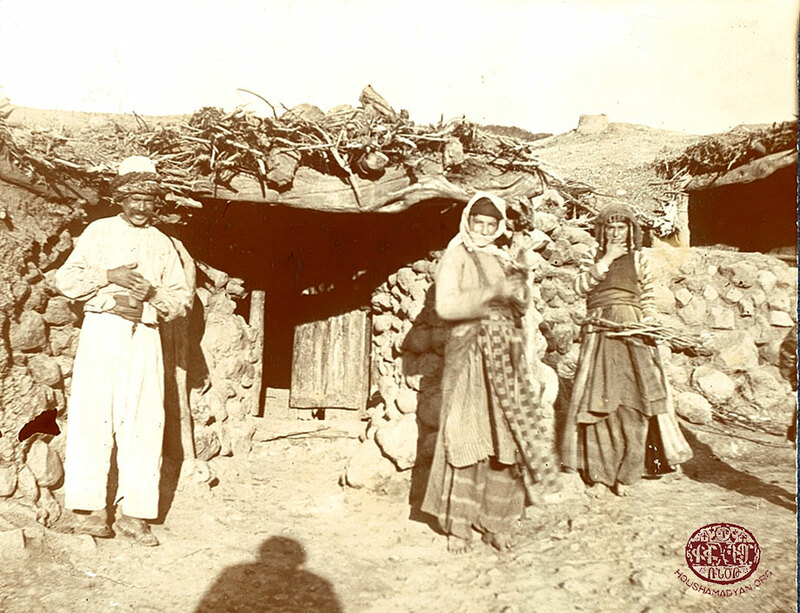 Armenian villagers of Semal (Plain of Moush) (Source: ARF Archives - Watertown, Massachusetts). Watery dishes in Moush are customarily called abour (soup), although the terms shorba, chorba, and vrig are also often used. There are varieties made with tahn, yogurt, and dried tahn, as well as those made with pickled/fermented cabbage. Boil the cracked wheat. Beat the yogurt and egg, and intermittently drizzle onto the boiling wheat while continually stirring. Chop the herbs and add to the soup before turning off the heat. When serving, add ghee if desired. Boil the cracked wheat. Beat the yogurt and egg, and intermittently drizzle onto the boiling wheat while continually stirring. Chop the onions and sauté in ghee. Before turning off the heat, add seasonings and mix in the sautéed onions. A few hours before cooking, moisten the chortan [dried tahn] with hot water. Boil the cracked wheat; press the chortan into a paste, add it to the cracked wheat, and boil together. Serve with sautéed onions. Boil the cracked wheat. Chop the onions and the artichoke, add them to the wheat, and continue to boil. Beat the yogurt and egg, and intermittently drizzle onto the boiling wheat while continually stirring. Before turning off the heat, season and mix in the ghee. Boil the lentils (or bulgur); add chopped chard, onions, garlic, seasonings, and ghee; continue to cook. Boil bulgur in water, sometimes together with onion and greens—but without ghee. Boil the lentils, add the bulgur then sautéed onions and seasonings, and continue to cook. Boil the chickpeas, add bulgur and sautéed onions, continue to cook. When serving, press garlic into it and garnish with chopped greens. Boil chopped cabbage and onion; add a palmful of coarse bulgur; season, then continue to cook. When serving, stir in ghee and chopped greens. Sauté the onions, add pieces of turnip, and continue to sauté. Add crushed dried tomatoes, chickpeas, greens, seasonings, and water; continue to cook. Boil the bulgur or rice in the water, then add the milk and ghee and continue to cook. Boil the wheat, add pieces of potato and sautéed onions, season, and continue to cook until all the ingredients are cooked. Boil the chopped greens, add the bulgur and sautéed onions, season, and continue to cook for another 15 minutes. Boil the noodles, pour boiled tahn over it, then add sautéed onions. Season with thyme and continue to cook. Boil the presoaked beans, add sautéed onions, noodles, and seasonings. Before turning off the heat, press garlic onto it. Cut up and boil the meat, then season it; add chopped onions and crushed dried tomatoes (or tomato paste) to the stew and continue to cook. In the meantime, combine the pounded meat and bulgur, knead the mixture with water, and form round and flat balls (koftas); boil them by adding them to the soup. Before turning off the heat, add chopped greens. Some also add two beaten eggs together with the greens. For the filling, fry the meat in its own fat, then add chopped onions and continue to cook until there's no liquid; season, mix in the walnuts, and leave to cool. Combine the pounded meat and bulgur, continuing to wet the fingers during the kneading process until a soft mixture forms. Take a portion of that shell mixture, form an indentation in it, stuff it with the filling, close the shell around it, roll it into a sphere and smooth the surface. Make the koftas the size of one's palm, as the term "ped" means "large." Boil the koftas in salted water, and serve hot. *Sometimes, pomegranate seeds are added to the filling. For the filling, fry the meat in its own fat, then add chopped onion and continue to cook until there's no liquid; season, mix in the rice and walnuts, and leave to cool. Take a portion of that shell mixture, form an indentation in it, stuff it with the filling, close the shell around it, roll it into a sphere and smooth the surface. Make the koftas the size of walnuts. Fry them in oil or boil them in salted water. Serve hot. For the filling, chop the onions and sauté in oil. Chop the dried fruits, mix them into the sautéed onions together with the walnuts, season, and set aside to cool. Combine the ingredients for the shell, and knead with water until soft. Take a portion of that shell mixture, form an indentation in it, stuff it with the filling, close the shell around it, roll it into a sphere, and smoothen the exterior. Make the koftas the size of walnuts. Boil them in salted water and serve hot. To make the koftas, combine the bulgur, flour, and seasonings; knead using water; form into small spheres. Chop and boil the pickled artichoke. Chop the onions and sauté in oil, add ground red pepper. Combine the artichoke, koftas, and sautéed onions, and boil (adding water if necessary); serve. To prep the filling, chop the onions, sauté them in oil, and season. Combine the ingredients for the shell, knead with water until soft. Take a portion of the shell mixture, open an indentation in it with the fingers, stuff with filling, close up the shell, roll into a sphere and smoothen the exterior. Make the koftas the size of walnuts. Chop and boil the artichokes. Boil the koftas in the same water. Add sautéed onions and serve. Chop the onions and sauté in ghee. Chop the cabbage, cook it in water, add a few spoonful of sautéed onions, season with savory, and continue to cook over low heat. In the meantime, combine the fine bulgur and flour, season, add a few spoonful of sautéed onions, and knead the mixture using water. Form into small spheres or squeeze small amounts in one's palm to form pieces; boil them in the broth and until they're cooked. *They also use the same kofta mixture to prepare palm-sized patties that they cook in the broth; after removing them from the liquid, they're cut up into pieces and served after topping with sautéed onions. Heat ghee; break eggs into it; sprinkle salt, pepper, and savory or thyme on top; cook without stirring or mixing. Heat ghee; fry a chopped onion in it; add beaten eggs; season and continue to cook. Heat the ghee, pour beaten eggs to it, add the yogurt and garlic, bring to a boil; sprinkle chopped greens and ground red pepper on top; serve with lavash. Beat the eggs together with the flour, milk, and salt, and fry in hot ghee on both sides. When serving, drizzle honey on top. Traditionally, this frittata is made by the mother-in-law for the new groom or, on the occasion of a baptism, by the grandmother for the godfather; it's also prepared in honor of respected guests. Chop up the horse fennel and blanch it. Fry it in hot ghee, then pour beaten eggs over it and continue to cook. Sometimes, the blanched horse fennel is first dipped in eggs and fried, with the remaining egg poured on top thereafter. In the winter, the frittata can be made with pickled horse fennel, which is washed several times before frying it in the usual manner. Fry onion and beet greens (the stems and leaves of beets) in ghee, add beaten eggs, and continue to cook. Serve by sprinkling chopped walnuts on top. Sauté green onions and garlic, pour beaten eggs into it, and cook. Combine chopped tomatoes and peppers to sautéed onions, add beaten eggs, season, and cook. Boil the presoaked beans, drain; combine with sliced onions and greens; season, toss in oil. The sorrel (spinach dock) is collected in the summer, woven together, and dried. In preparation for use, it's washed in hot water, chopped, and boiled. Boil crumpled pieces of sorrel and drain. Slice the onions, sauté them in oil, and add ground red pepper; mix in the sorrel and continue to fry. Turn off the heat, combine with smashed sorrel and greens. Boil the beets and cut into pieces. Slice the onions and sauté in ghee/oil, combine with beets, season, and serve. Boil the chopped mallow, drain; combine with yogurt, add pressed/smashed garlic into it, and season. If desired, top with melted ghee or sautéed onion. This is a commonplace diluted-yogurt dish eaten with pieces of bread; it's typically prepared in the fields. Chop cucumber, green onions, garlic, and greens; add yogurt and salt; tear off pieces of bread into it and eat. Boil the chard, drain, set aside to cool. Season, add oil and skhdorchour ["garlicwater" (a liquid seasoning or dressing made with smashed garlic, vinegar, and salt)]. Slice the onions, add salt on top and press/rub, then combine with the remaining ingredients. Boil the potatoes; after they're cooled, cut into cubes, add sliced onions and chopped greens. Season and dress. Slice the lettuce leaves, combine with chopped greens and green onion, season and dress. Shred the cabbage, press/rub with salt, mix in chopped greens and smashed garlic, season and dress. Slice the cucumbers; chop up the peppermint, green onions, and garlic; combine, season, and dress. Bake large beets in a tandoor, peel, sprinkle with salt, and eat. Slice the pumpkin, bake in a tandoor, sprinkle with salt, and eat. Chop chard, blanch in salted water, drain, season with red and black ground pepper, add green onion and garlic, dress with vinegar and oil. Cook pokhintz [grain that's toasted then ground into flour] in water and salt. To serve, fill each plate or bowl with the mixture; pour milk around the circumference of the dish; top it with honey and ghee in the center of the mixture. Heat the ghee, then add the flour and toast over low heat, continually stirring until the color begins to turn pinkish [i.e., becomes roux]. Turn off the heat, add the sweet syrup, and continue to stir until homogenous. Fill onto a plate, spread and flatten; after cooling, cut into pieces and serve. Sometimes, it's instead formed into small, palm-squeezed pieces. For holidays or special occasions, raisins and chopped walnut or almond are arranged on top of the nougat. Usually, this is a simple dish made of flour that's been diluted in water, boiled, and served with ghee on top. There are also minor variations of it. Dilute flour in water, add ghee, bring to a boil while continually stirring. Serve by filling small dishes and drizzling roub with a large spoon onto the center. While eating, mix and stir. Dilute flour in water, add roub, bring to a boil while continually stirring. Serve by filling small dishes and putting a small spoonful of ghee onto the center. Dissolve the starter in warm milk until it ferments; combine with the flour and melted ghee, and knead until a soft but not sticky dough forms; after making an indentation in the dough in the form of a cross [as a religious/superstitious ritual], cover, and set aside to rise. Combine all the ingredients for the filling. Form the dough into balls, create a passage into each ball with the fingers, stuff it with filling, seal it, decorate the surface with fork-tine marks, and arrange in an oven tray. Brush the surface with the egg-and-milk wash, and bake in the oven in medium heat. *The same dough is used to make kata without filling, which is called anchour ["waterless"] kata. **The smaller version of kata, prepared for children, is called gougou. ***Khach ["cross"] kata is the term for the kata decorated with raisins in the shape of a cross and sent from the groom's family to the family of the bride during the henna ceremony that takes place before the marriage rite. To prepare the dough, combine the yogurt and baking soda; separately, mix together the ghee and the flour; then combine the two sets of ingredients and knead. Form into two balls and set aside to rest for hone hour. Constitute the filling by using the fingers to clump together the flour and ghee. Roll out the balls of dough. Place one sheet onto an oven tray, top with the filling, cover using the other sheet of dough, seal the edges, brush with egg wash, decorate by puncturing the surface, and bake. *Gjoj is the type of kata made with the same dough but without the filling. This is the kata prepared during mid-Lent—made without ghee, milk, or eggs—and with a fortune-telling component (a coin placed within it). Combine water, oil, salt, baking soda, and vinegar; add flour and knead the dough; make a cross-shaped indentation in the dough, cover, and set aside for half an hour for the dough to ferment and rise. Again knead the dough, place a metal coin in it as a token of luck/fortune; form round loaves, press in the raisins and walnuts on top as decoration, brush with water, and bake. Immediately after removing from the oven, brush the surface with honey. Combine the water, oil, salt, baking soda, and vinegar; add flour and knead the dough; make a cross-shaped indentation in the dough, cover, and set aside for half an hour for the dough to ferment and rise. Form the dough into walnut-sized balls, open up each ball using the fingers, place a small amount of filling within it, fold over unto itself and seal the edges, pat into a flat shape, fry on both sides in ghee or, during Lent, in oil. After it cools a bit, drizzle honey or roub on top and serve. In the days preceding Lent, women wet wheat berries, spread the wheat on large trays, and place the trays in a corner of the structure that houses the tandoor so that the wheat germinates; they monitor the wheat to ensure it remains damp so that it produces sprouts. When the sprouts are the length of a finger, they separate out its liquid by pounding the sprouts in a pestle and pressing the pulp through a strainer; then, adding a sufficient amount of flour, they cook it until it caramelizes and it thickens. This sweet, satisfying paste is a daily staple during Lent, particularly for children and the elderly. During winter holidays, they toast wheat, then grind it into flour. That pokhint flour is kneaded with ghee, roub, and water, then formed into sweet, palm-squeezed pieces. On the occasion of the St. Sergius holiday, they prepare the nougat/halva called khashil, which is made by cooking the pokhint flour in water; it's eaten after ghee and roub are drizzled on top. Khoshaf is prepared by pouring an abundant amount of boiling water onto raisins or other dried fruits. The pot is then wrapped in heated covering so that the contents are better macerated. Some also mix roub into the water. Hot khoshaf is drunk as a medicinal tea; cold khoshaf as a refreshing, nutritious drink. Vegetables (potato, beet, carrot, turnip, radish, etc.) are stored underground, in a pit behind the house, and covered over with earth. Onion and garlic are dried. Tomatoes, peppers, eggplant, and green beans are dried by stringing them and hanging to dry. Cabbage and pumpkin are arranged in the store room; similarly, some fruits, placed in large baskets, are stored in the cold and dark store room. Greens/herbs are dried, as are various leafy greens—some of which, however, are preserved by pickling. Moistened wheat is pounded in a stone trough/tub to make cracked wheat, which is used in soups and harisa. Wheat is also boiled, pounded to remove the chaff, and dried, then ground to make bulgur. Coarse bulgur is used in pilafs, dolma, and soups; fine bulgur is used for making koftas. Oil is derived from sunflower seed or hemp seed. As is the case in all regions [of historic Armenia], it's customary in Moush to dry fruits during the summers. Winter pumpkin/squash is sliced and dried, then cooked in roub to prepare jam. Wheat is germinated, pounded in a pestle to remove the chaff; the wheat berries are dried, then milled into farina. To preserve strained yogurt, it's pressed into a crock or jar with butter, in layers, and heated ghee is poured on top. It's served with honey and eaten with bread. When milk is abundant (spring and summer), lactoderm is collected and churned to make the butter; it's preserved in salty churn liquid until a sufficient amount is collected with which to make ghee (clarified butter) by heating. While heating whole milk (fat content intact), acetic liquid (whey-based) is added to the milk, which then curdles, becoming cheese. While still warm, it's transferred into a cotton-cloth bag and a heavy rock placed to fully drain the contents, which is subsequently stored in heavily salted water. The whey formed during the cheese-making process is boiled, then strained, leaving behind residue, which is preserved by adding salt and dried greens/herbs. Boil skimmed milk combined with sour yogurt until curdled; drain in a linen-cloth bag; place the bag on ashes so that the liquid is drained off. Crumble the strained curds, add salt and string cheese, press into crocks/jars. Keep crocks/jars upside down on ashes for a full week to drain. Store in a cold and dark store room until it begins to mold and turn green. Leave out skimmed milk one full day until it sours. The next day, combine with an equal amount of fresh skimmed milk, and heat; during that process, add acetic liquid. When the milk curdles, separate out the yellow liquid, work the milky pulp with the fingers, stretch out filaments of it, and hang them on the churn. After they cool, cut them into pieces, arrange in a crock or jar while sprinkling salt on top; on its own, liquid will be extracted to form saltwater. A wide-mouthed pot or cauldron filled with lactoderm is placed at the opening of a still-warm tandoor the fire of which has been extinguished; there, the substance comes to a slow boil and thickens. It's then cut into pieces and placed in a boudoug (cooking pot); honey is poured on top, then it's stored. Flour, salt, and water and mixed and kneaded into a hard dough, which is formed into balls and left to rest for 7-8 hours. Roll out the dough into thin sheets, cut into slices, lay them out to dry, then toast them. Store in paper or linen bags. Cut fatty meat into palm-sized pieces, boil in salted water until the water completely dissipates; then fry the meat in its own fat. Lean red meat is sliced into thin strips, salted, and hung on a clothesline to dry under the intense summer sun. It's then stored in crocks or jars. In colder areas, they simply add copious amounts of salt to the meat; after the blood is extracted, the cured meat is placed in crocks or jars and stored. Vegetables left in the fields in late autumn (cabbage, carrot, cucumber, Armenian cucumber, eggplant, pumpkin, tomato, pepper, etc. ), or some type of fruit (small apples, pears, etc. ), are placed in casks; barley kernels, chickpeas, and grapes are strewn on top; then, filling the cask with salt water, the vegetables or fruits are left to pickle/ferment. Cut cabbages into quarters and arrange them in a barrel or cask; sprinkle with coarse salt; add the liquid that's been prepared by dissolving starter in warm water. Arrange stones on top so that the cabbage doesn't float up above the saltwater before it's pickled. Blanch the horse fennel, place in a crock or jar, add saltwater. Cut up the cabbage, arrange the pieces in crocks/jars, interspersed with chickpeas, grapes, peppercorn, and barley bulgur. Prepare the saltwater with starter and fill the crocks. Blanch young, small beets, including their stems, and arrange them in a crock or jar, fill with regular saltwater, and add a handful of chickpeas. Cut up the turnip, bring to a boil once, place the turnip in crocks or jars, add one beet into each crock/jar, fill with saltwater. Very young, small and still seedless cucumbers are called bloj. They're punctured all over and arranged in a barrel or cask, which is then filled with saltwater. My thanks to Mrs. Vart Abajian of Ashnak, a transmitter of oral tradition. Her roots are from the village of Manazkert, in Moush. She is the grandchild of Mirzo of Moush. Ardashes Der Khachadourian, Haygagan Dohmig Or, Daron, Jashatsang 5, Hamazkayin Cultural and Educational Association, Beirut branch, 1983, Beirut. Ardashes Der Khachadourian, Daron, 1950, Beirut. Garo Sassouni, Badmutiun Daroni Ashkharhi, 2013, Beirut. In preparing this article, the author has relied in significant part on works published by Ardashes Der Khachadourian. 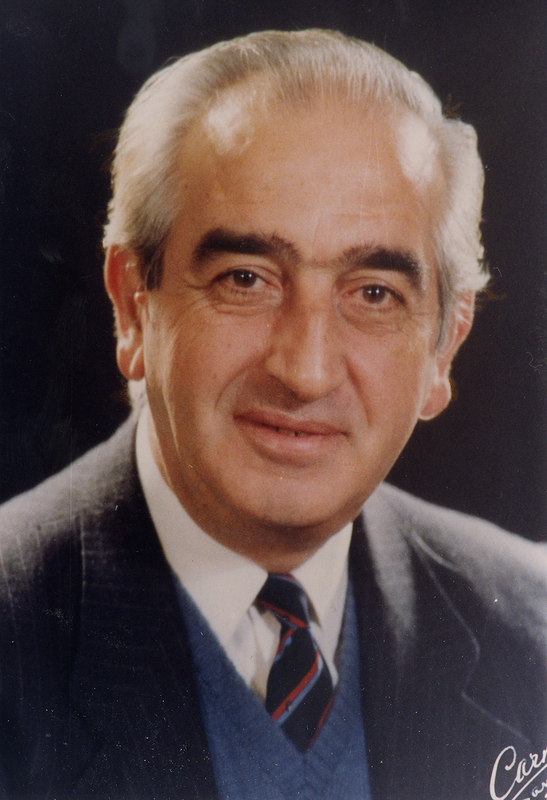 Ardashes Der Khachadourian was born in Beit Mery, Lebanon, in 1931, and died in 1993, in Beirut. His father, Hamazasb, was from the village of Khashkhaldagh (now Kıyık) in Moush; his mother, Azniv, was from the village of Tsronk (now Kırköy) in Moush. 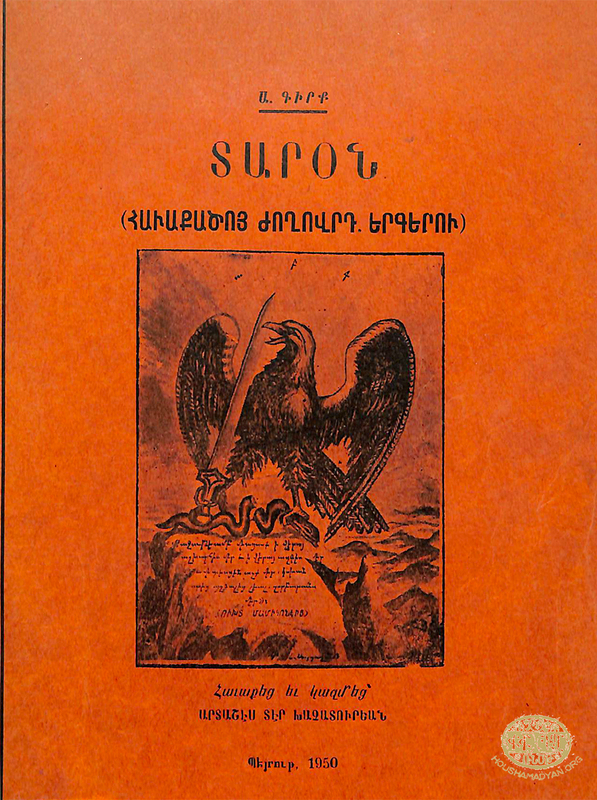 He was a bibliographer of Armenian publications, a linguist, lexicographer, grammarian, philologist, historian, editor, and lecturer and teacher. He was a graduate of the department of history at the American University of Beirut. He taught primarily at the Armenian Evangelical College of Beirut and lectured at the Hamazkayin Higher Institute of Armenology. He is the author of many books and the organizer of numerous exhibitions devoted to the Armenian press.